A hand made Michael Leunig limited edition fine art engraving etching print titled Lullaby is available at Etching House, a limited in edition of 90 only etching – engravings are made by hand on 300 gsm Somerset archival paper, each etching is hand signed by the artist Michael Leunig, price is $650 subject to change.Lullaby image size is 225mm High x180mm wide, sheet size is 460mmx380mm. Michael Leuing October 2017 has released 6 additional hand made etchings titled, etching prints are Jonah and the Whale 2, Escapade at Night, Fanfare, Fanfare 2, Happy Outcome, Sketch for Spring, Sketch for Spring 2, all are hand signed. 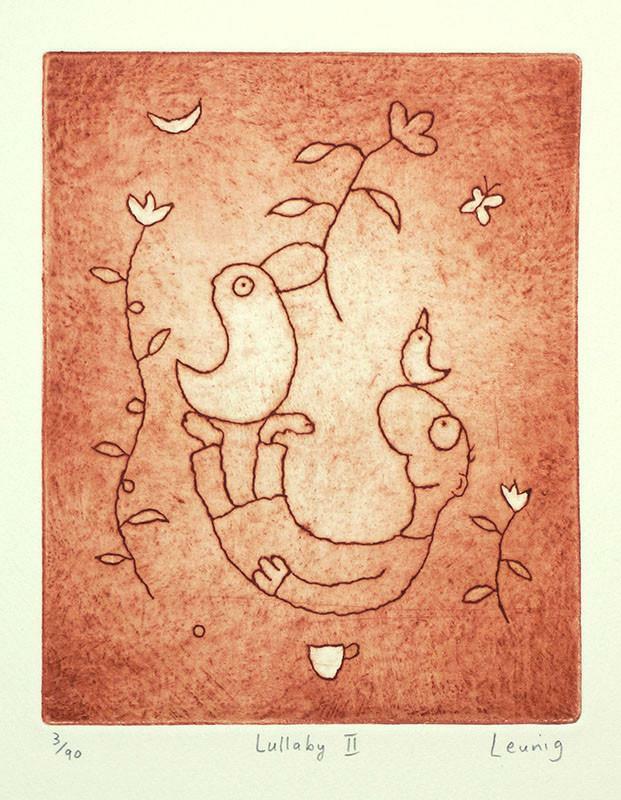 Available from Etching House are Hand Made Michael Leunig limited edition fine art engraving or etching prints, made by hand and printed on 300 gsm Rag fine art Somerset archival paper, each etching engraving is hand signed by the artist Michael Leunig, prices are subject to change without notice.